Miller & Meier is present in the key lobbying and campaigning capitals of Berlin, Brussels, Paris and Washington, D.C., and has a proven global network of partners. A number of companies in Washington, D.C., rely on our expert advice in matters relating to the German and European political systems, which we provide as part of our Transatlantic Strategies. Our Berlin and Paris axis, which adds to our EU-competence in Brussels, reflects the current european development towards stronger bilateral cooperation. We enable our clients to adopt a global approach to governmental relations that takes cultural and political differences into account. That is why it is particularly important to us to cooperate with owner-managed consulting companies in countries of the EU as well as in the USA and Asia in order to effectively and efficiently support our clients in a globalized and fast-moving environment. 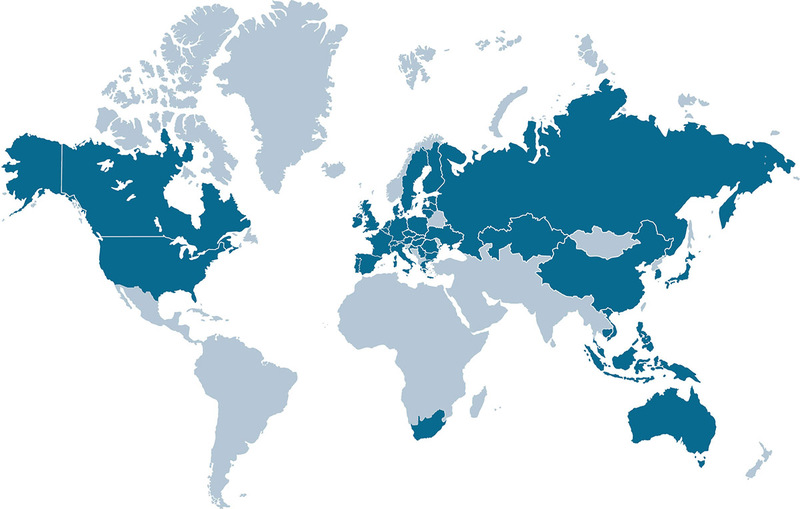 As a member of FIPRA, a global network of independent, owner-managed political consultancies, we are in contact with consultancies in over 50 countries around the world. Brickfielder Government Engagement is one of Australia's leading public affairs consultancies. The founders Jane Madden and Vanessa Findlay have decades of experience in representing interests. Its broad range of clients and services covers both the public and private sectors and the area of international relations. Ecker & Partner is a Public Affairs Consultancy based in Vienna. Since 1998 Ecker & Partner provides service on all aspects of of public relations work, including corporate PR, lobbying and crisis communication, event management and social media. Mastermind provides comprehensive public affairs services for clients active in the fields of business and society. Their main task is the articulation, implementation and safeguarding of the legitimate interests of clients with respect to political decision-making bodies and all relevant stakeholder groups. Their core expertise includes government relations, strategic media relations, campaign management, political audits, corporate social responsibility & community relations, reputation management and online issues management. Fama Consulting offers services in the field of public affairs, parliamentary advocacy and government relations. The Sofia-based company maintains a well-established network of politicians, policy makers and implementers, public servants, think tanks, media and business community representatives. They focus on maximising clients’ leverage while at the same time containing business risks stemming from political and regulatory environment. Tactix is an Ottawa-based government relations and public affairs consultancy. Their clients range from Fortune 500 companies to start-up Canadian enterprises. Tactix provides the following services among others: strategic counsel, government procurement, crisis communications, reputation management, regulatory approval, coalition building, perception audits, product defense, and mergers and acquisitions. Founded in February 2004, Yuan Associates is a premier government affairs consulting firm in China. The company’s goal is to facilitate communications and improving win-win cooperation between multinational companies and the Chinese government at all levels. Vlahovic Group is an important professional public policy and regulatory affairs firm in Croatia. It has a broad public affairs network in Southeast Europe with a team of local advisers available to assist specific client needs. Vlahovic Group has been advising international and domestic clients in Zagreb and Brussels on political and government communications, EU affairs, investment strategy, and local community outreach. The company is also a member of the Fipra network. Pyrog Congress is a consulting firm focusing on PR, lobbying, conference organizing and communication. For Cypriot as well as international companies, Pyrgos offers lobbying and PR services, taken into account the European level, and supports clients with web design and travel planning. CEC Government Relations offers professional and transparent public affairs advice for Central Europe since the 1990s. Apart from political monitoring services, advocacy, coalition building and regulatory impact assessment they also assist clients in EU campaigns. CEC maintains offices in Warsaw, Budapest, Prague and Bratislava. Firstline Communication is a public affairs agency with more than 60 years of international experience in strategic communication, lobbying, crisis management and sustainability planning. Among Firstline Communication’s many references are a number of prestigious international companies. Cross Border Communications Experts (CBC15) is a network of four, highly experienced communication and strategic consulting agencies in northern Germany and Denmark: duag, Firstline Communication, Miller & Meier Consulting, and Nebelung Kommunikation. Operating out of Berlin, Copenhagen, Hamburg, Kiel, and Lübeck the network offers strategic communications and sustainability consulting with a strong focus on public affairs, lobbying, issues and crisis management. META is a leading consultant in pan-Baltic government relations. In Estonia, META has offered a full public affairs service since 2009 and is one of the five largest companies on the Estonian market. Based in Helsinki, Finland, 4c Communications was founded in 2004 by two partners who together have more than 50 years of experience in communications consulting. The company has a high level of expertise in management consulting as well as solid practical experience in the area of public affairs and wide-reaching cultural and media relations. Palladian Communications Specialists is a leading, but relatively low profile communications firm based in Athens, specializing in communication strategy, media relations, public affairs and crisis and issues management. Palladian has developed and implemented a number of successful communication campaigns on behalf of its clients on a series of “delicate” issues, which changed the public’s perceptions and influenced developments. Vriens & Partners is a Singapore-headquartered corporate advisory firm specializing in government affairs, public policy, and political risk analysis in Southeast Asia. Its mission is to build bridges between business, government and society. Vriens & Partners principals, over many years spent in both the private and public sector, have acquired expert knowledge of both the legislative processes and media environment in their respective countries. They have developed strong and reliable networks among senior civil servants, politicians, journalists and business leaders in Asia. Policy was founded in 1988 by Boris Krasny, who still heads the consultancy. The Israeli lobby experts provide advices on developing positioning strategies for political and business clients as well as crisis management and advices on communication strategies. GR Japan is a leading Tokyo-based consulting firm specializing in government relations and public affairs. With many years of experience and direct contacts in Japanese politics and society, the expert team offers a wide range of services, including policy monitoring, stakeholder mapping, political due diligence, strategic outreach and public affairs campaigns. Kesarev Consulting is a consultancy with offices in Russia, Kazakhstan, and Ukraine. The 20-member team focuses on PR advices and crisis communication. Kesarev Consulting operates in the following fields: Agriculture, health, financial services mining and energy. Strategic Communications is an agency for marketing, Web design, PR and coaching that offers its services to a broad portfolio of international clients active in various industries. In addition to traditional services in the marketing segment, Strategic Communications also takes on projects from public authorities, such as the introduction of the Malta Short Sea Promotion Centre. Public Matters is one of the leading public affairs agencies in the Netherlands and strategically located in The Hague. Their focus lies on accompanying regulatory initiatives through political monitoring, political strategy consulting and advocating clients’ interests. Public Affairs Coaching & Consulting was founded in 2008 and is an expert in public affairs, issue management and communication consulting. The main expertise lies in the health care sector. The firm also offers coaching in the fields of communication, public affairs and stakeholder management. ISIR is a professional agency specialized in public affairs, advocacy, digital content and audit. ISiR offers wide range of services from image-building to relationship building with the key stakeholders and target groups. ISiR’s competent team selects proper tools and prepares tailor-made strategies for project implementation, choosing the best communication channels and forms of dialogue in order to achieve pursued objectives. Omniconsul was founded in 1976 in Lisbon, making it Portugal’s first and largest communications consulting agency. Today, Omniconsul is also Portugal’s leading company in the communication sector, having implemented a number of successful projects for global corporations, institutions, associations and governments. Point PA is a communications agency advising clients in the fields of public and legal affairs since 1995. Their expert team monitors and is actively involved in the implementation of the ethical principles and standards in lobbying and business conduct. Point PA is founder of the “Romanian Lobbying Registry Association” and a member of the AmCham Romania. Triangle Consulting Group is a coalition of organizations and experts in the field of consulting with a high level of expertise in different areas, including research and analysis, management consulting, organization and communications consulting, coaching and education projects. Bovan Consulting is a consultancy dedicated to highest professional standards in offering professional services and advice, focused at fulfilling political and business interests of selected clients. Founded in 2001 with partners from Great Britain, it is focused on business strategy and management consulting, legal and political counseling, reputation management and strategic communication. Bovan Consulting provides innovative and applicable solutions primarily focused at increasing efficiency, productivity and profitability of clients. Vriens & Partners is a Singapore-based corporate advisory firm focused on Southeast Asia and specializing in governmental affairs, political risk analysis, and public policy. V&P has offices in Singapore, Thailand, Vietnam, Myanmar, Hong Kong, Indonesia, Laos, Malaysia, Cambodia, and the Philippines. The firm provides independent appraisals of the political risk associated with existing and potential investments, expert analysis of public policy issues and strategies for engaging local stakeholders. Corporate Image is a communication and public affairs consultancy based in Cape Town, South Africa. Formed in 1987, Corporate Image has been extensively involved over the years with the corporate FMCG, financial and industrial sectors. The company has particular expertise in reputation research and management and corporate brand strategy, with a focus on corporate communications, media liaison, research, positioning strategies, crisis communications and issues management. Macoll Consulting Group has established itself as a reliable partner in South Korea over the last seventeen years, working closely with government and industry representatives in the areas of communications, politics and business. Above all, Macoll Consulting Group stands for trust, integrity and excellence. Political Intelligence is an independent Public Affairs consultancy, established in 1995 with a presence in the key European markets. Political Intelligence provides a full range of public affairs services that help clients participate in the policy making process and communicate their key messages effectively. Through their partners, Political Intelligence also offers wider communications services to ensure campaigns are integrated and impactful. K-Street Advisors is a Swedish agency for strategy and communication based in Stockholm. Since 2005 K Street Advisors supports companies, politicians, organizations and government agencies that wish to increase their space to maneuver and realize their goals on markets characterized by political regulations, strong value judgments or harsh competition. MC&P develops and implements customized strategies and roadmaps for effective lobbying activities and professional political communication for its clients. As political experts with many years of experience in the major arenas associated with government, politics, administration, economics and the media, MC&P assists in the successful positioning of organizations and companies and also in lobbying activities, the detection of market opportunities, reputation enhancement and the carrying out of exciting events. Cavendish is an independent public affairs consultancy, established in 2003 and based in London. Since then Cavendish has been helping companies, charities, campaign groups and public bodies with their political relations at all levels in the UK and in Brussels. With its insights in the policy making process Cavendish provides clients with advice on shaping the policy agenda, developing and implementing campaigns and reputation management. Kissmann Langford was established in 2002 by Edna Kissmann und Martin Langford in London. The communication agency is specialised in advising clients on strategic positioning, topic management and crisis management. Chamber Hill Strategies is a boutique public policy and consulting firm headquartered in Washington, DC that specializes in helping companies and organizations navigate the federal legislative and regulatory landscape. Through strategic counsel on legislative initiatives, regulatory matters and political positioning, the company assists clients in understanding and shaping the federal policy agenda to achieve their strategic business objectives. Convergence is an integrated communications consulting agency for political, issue advocacy and independent expenditure campaigns. Envision Strategy was born out of the desire to deliver and exceed expectations for clients. As a team, we expect the best out of ourselves, and have built something more than a lobbying firm; a team built for global advisory as well as government affairs. With this breadth of vision and bipartisan relationships, we open doors in states, in Washington, D.C, and globally. We gather intelligence, effect policy outcomes, build markets, and bring substance to issues.